Dear Abba, you’ve brought me this far. Through all those millions of moments when I didn’t think I could take even a single step, when I didn’t want to take even one more breath. My life shattered. My heart broke. When Carl died, my old self died right along with him. You know this because you’ve been alongside me, through every single moment of it all. You were there when I kneeled down next to the driver’s seat of that crumpled car. You were there there when I stood in the snow at the site of the crash, semi-trucks and cars barreling down a busy two-lane highway under a sky that I remember being neither blue nor grey. But for a moment, dear Abba, You quieted the world and created space for the most intimate conversation I may ever experience on this side of heaven. You were there when I told Carl it was ok, that I knew he didn’t mean for this. You were there when I told him it was ok for him to go, as long as he would stay with me as long as I needed him, it was OK because I knew he was going Home to You. Dear Abba, I could feel you. You were in us and with us; You were everywhere and everything. Carl’s presence was separate from mine, yet also like an illuminated medallion of light lodged in the brokenness of my heart. Oh, dear Abba, you allowed us to merge in a way that defies language, right there on the ugly side of the road that took his life. Surrounded by freshly fallen snow and utter loss, You allowed us this. Not just the idea of Carl being with me even after death, but truly, in that moment you gave us the gift of uniting our spirits in a very real and living way. I told him it was ok. And in that moment, we both knew…it truly was ok. And I felt him go. I felt him being absorbed into You. I felt it right along with him. Dear Abba, you let me die with him, and it was the most glorious feeling I will ever know until I meet You again on the other side of death. This glimpse of what it is to go Home. I felt it. I know. And nothing will ever be the same again. Not ever. In the eastern pasture, the horses are contentedly munching on the new sprouts of green grass along with the rising sun that has been shining directly into my eyes these past couple mornings, waking me at what seems like an abundantly early hour. I use the word “abundant” because it feels good to get up so early, welcomed into the day by such a direct invitation from what feels like God himself. Most mornings I wake up praying. It is not an intention or decision to pray, rather a conversation that is already happening. Many nights even my sleep is filled with prayers and so, when I wake up, it is simply a more conscious awareness of continued communication. I savor these moments. I sink in and attempt to make them last as long as possible. This morning I woke up praying about Joy, a young girl I recently sponsored through Hands of Action International. 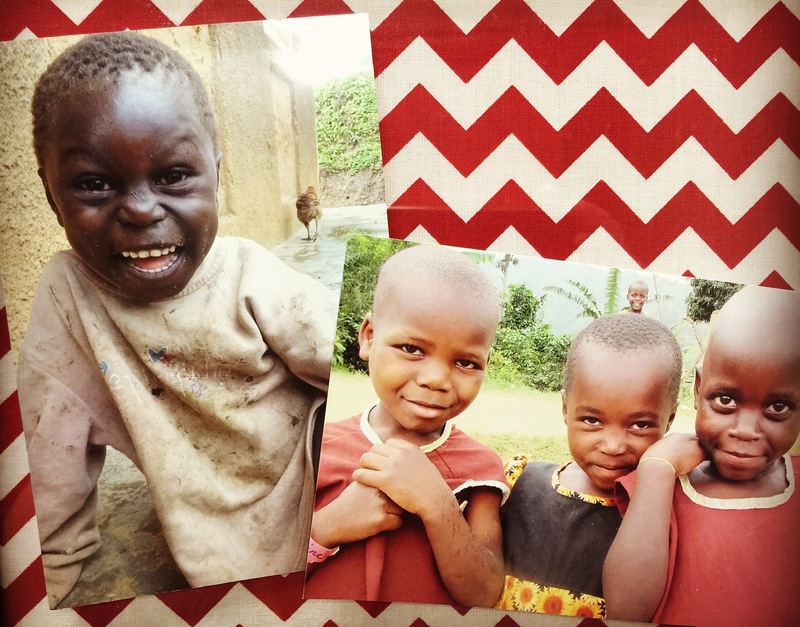 That was about a month ago and I have been obsessed with the kids of Uganda ever since. Yesterday I learned that Joy is 10 years old and an orphan. She owns a mosquito net and uses it, but she does not have a school uniform or even shoes. Not all of the children needing sponsorship are orphans. I woke up thinking about her. I was wondering what her personality might be like. I prayed that she has someone to comfort her when she needs it. I thought about her feet and the red dirt, puddles and jiggers. I tried to imagine her smile and wondered if it comes easily. I wondered if she likes to be hugged and what it might be like when I finally get to meet her for the first time. Will she be shy? Will I? I thought about her name and the deep meaning it holds for me, yes, even beyond the obvious (a sacred story to hopefully be shared someday). I thought about my own life and where God might be taking me. All of these thoughts and questions and imaginings somehow held in the safety of God’s arms and a golden sunrise. Today my heart feels a certain kind of peace. Yesterday I felt unstoppable excitement. I spent the entire day apologizing to everyone I interacted with for being so overwhelming. Maybe no one minded as much as I thought they might. I was overcome with happiness. Like this. Like the girl in the photo above. I don’t know who she is. Or the others either. I only know that they are the ones that I have become passionate about. They make me feel happiness and I want more of it. My heart feels alive again. A miracles, yes…a miracle, to be sure. I’ll spend the day painting in the studio. I’m preparing for my largest solo exhibition to date and also a fundraiser for rescue dogs. I paint and pray and try to stay contained in my own skin so that I might stay in better pace with God. No running ahead, no falling behind. Then I’ll come home and work on photos of the kids for a new sponsorship website page. There are 500 children we are working to feed and clothe and send to school. Yes, I used the pronoun “we.” It feels miraculous. I feel a part of this. Thank you, Abba. There is so much to do and I feel such eagerness to help do it, whatever it is. This newfound eagerness has a strange way of fueling the obligations to even my own work that’s at hand. These paintings I’m currently working on are filled with more prayers than any I’ve ever done before. I do not doubt that much of my newfound energy and eagerness is coming from the sheer amazement and joy in feeling happiness again. I always feel it when I think of those little kids in Uganda. There is joy and a desire to move in that direction that simply overtakes me. This feeling of happiness is still utterly foreign to me after such deep grief. And yet it is also welcome…so very welcome that I am reduced to tears. The grief still exists, but now it is saddled equally with hope–the tangible sort–made up of real possibility and action step that are being made more and more clear each day. I smile and cry and sing gratitudes to the Lord, all at once. Posted on May 22, 2015 May 22, 2015 by jessiemarianiello	This entry was posted in faith, God, gratitude, grief, healing, hope, journeys, joy, music, painting and tagged bible verses, christianity, faith, god, grief, happiness, hope, journeys, joy, love, music, prayer, purpose, uganda. Bookmark the permalink. ← Let her sleep for when she wakes, she will move mountains. So eloquent in your writing. I really think I can FEEL some of what you feel. Thank you for sharing. Two things: 1. Are you going to have your art show in Mpls? If so when? 2. I really would like to help in any way that I can with what you are doing for the children of Uganda. I can donate money or sponsor a child but if there is anything else, hands on, that I can do from here let me know please. You are gifted and very special! Thank you so much, Reuben. It was not what I was planning on writing. I was half way done with the first blog post when my computer seized up and it all disappeared! When I started over, this is what came out. It surprised even me. The tears came from such a deep place as I wrote the first part, but my heart was so filled as I wrote the 2nd part. Truly a gift from God. And Joy…oh, she is already blessing me in ways I never expected. Looking forward to checking out your writing about grief from a child’s perspective. Blessings to you.